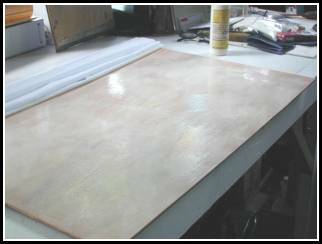 Making painting panels for fine art. Preparing for a year of Painting on Location. This page's url is named gettingstarted.htm. It begins the connected pre-painting links including the course. 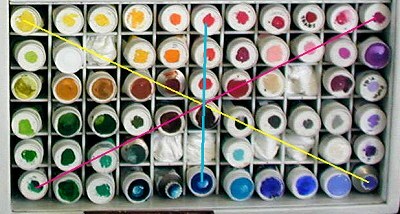 Drawing and painting techniques, using paintings as examples. Make a Brush Holder Notches are cut in a 1" wooden angle piece. Years later I found and bought a porcelain Japanese chopstick holder. The finest brushes in the world are shown in this brush holder. I designed the brushes myself. Sand and repaint my sitting easel. Dressing up my easel is my first step, it's been out in the sun and rain a lot. It may look strange but it works great. No matter what size painting support I'm painting on, the top of the support matches to the bottom of the view. Also, the angle of the support panel is adjacent to my eyes view. Let me explain. The top of the support and the bottom of the support are both the same distance from my eyes, so I see a squarely shaped panel.. That's an adjustable leg at the back for rocky terrain, and the table ledge that holds the two sides apart is usually flat down, it's drying now. 25 years later I'm still using the same easel, 2013. Making the boxes and painting support panels. 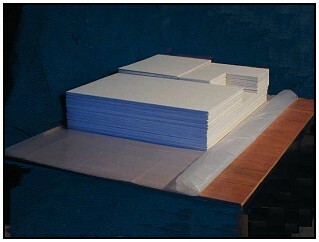 Supplies; 5 sheets of 4'x8' 1/4" inch birch plywood and 3 sheets of 1/8 mahogany plywood. 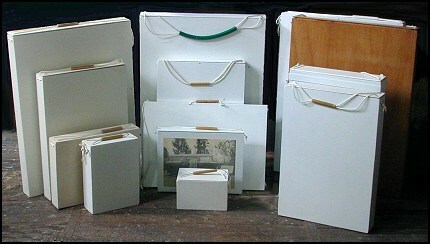 This made five sizes of boxes for storage 22x30, 15x22 and 11x15, 11x7.5 and 5.5x7.5. Here are the lidded boxes with the 22x30 painting panels all sanded. Four days work. Two sizes to go, plus painting them. Slightly round the bottom corners and ends but not the top corners edge, that's part of the painting surface. I'll sand the points off the corners of the painting surface after the cloth is in place. Six sides are sealed before the cloth is glued on the face. I use lacquer as the back and side sealer because it's permanent and when finished they slide in and out of my box better. 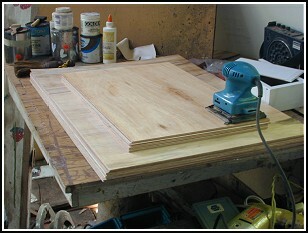 Before applying the sealer, sand all the corners slightly round. Paint the sides first with each coat of sealer than the face. The face gets a pre-sealer coat of thinned water based PVA before the final glue coat attaching the cloth. 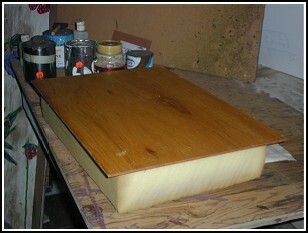 This sealed panel is sitting on a block of foam. Many would say that this step is not necessary and that painting on primed wood is perfect just as hard pressed Masonite is perfect, and I agree. I just like the idea of cloth and board making a strong support. 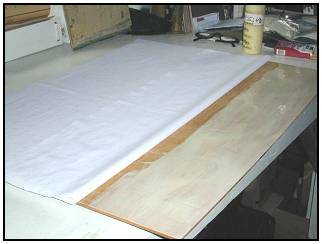 Also by using a thin polyester, linen or cotton bed sheet as the cloth it actually makes a thicker coat of gesso because the first coat of gesso bonds through the cloth to the glue underneath. I'm betting this could add extra years to the life of the painting. Iron the cloth. Cut the non shrinking polyester cloth 1/2 inch extra all the way around. Old bed sheets are best because all the size has been washed out and they are soft without creases. Iron the sheet first anyway. Position the cloth and glue one side in place. Cleanliness is #1. 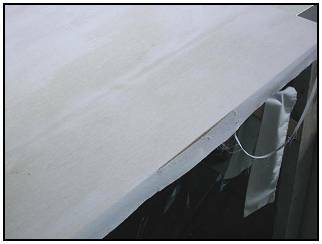 The glue rarely comes through to the surface of the cloth. Gesso will penetrate down to the glue. The trim cut is made with #120 grit sandpaper held with a block at this angle, 45º. This way the sealed cloth edge can't be reached directly from the side. After trimming all the sides and slightly rounding off all the corners the panel is ready for it's first coat of thin gesso. Finished, at least one months work. Sand everything smooth and apply the second full strength coat of gesso, including the sides. Sand it smooth between coats with a sanding block and 120 grit wet/dry sandpaper, dry. The third coat of gesso is thinned 20-30%. Thin enough so this last coat won't leave brush marks. Sand this coat with 220 grit to take any shine off the gesso. Don't forget, do the panel sides first and last. Ready for traveling and painting on location. 100 some hours later, $80. for lumber, $10. for PVA glue, $40. for a gallon of gesso and 4 polyester bed sheets. store both the blanks and finished pieces. 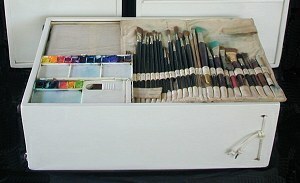 This is my water color and pastel box. 18 color wells, click for colors. Basically it has three compartments, one for my distilled turpentine "Silicoil Jar", one for my media bottles, damar and wax mix, copal, Marogers, alkyd, my Venetian glaze oil mix, raw linseed oil, sun-dried linseed oil and safflower oil. 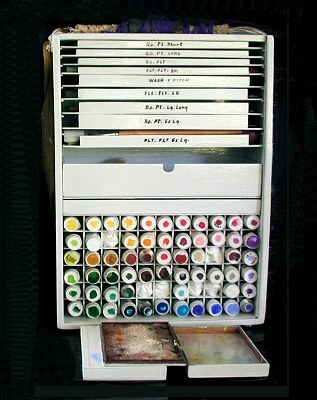 The large section holds my paint tube tray and brush-palette box. The air-tight lid has a slide out palette, the circle on the bottom of the palette is a spin handle allowing me to turn it, bringing the working color to the proper working position. Click here for my palette colors matching the Real Color Wheel. Behind the palette in the lid there is room for a cut-out space holding four painting knives. 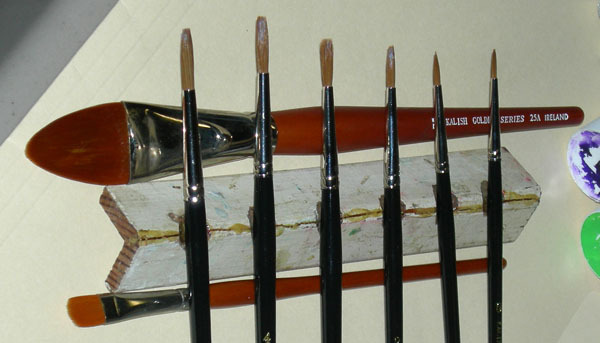 The top nine drawers contain brushes, enough to do any size painting including a mural. The empty slot holds two palettes, with a flip of the wrist they open or close. Embedded on the lid is a cloth to hold moisture, the individual palettes are removable styrene sheets. Than comes catch all drawer and another removable brush box with a lid. I started with standing with my arm at my side to measure how much room I had in inches. A two inch walking space below the box would be good. I measured only a 1" space to the ground. But I didn't figure on walking up hills or stairs so I have to be careful. The 1/8" thick nylon rope threads through a 5" hand holding hose or plastic tube. This handle is 2.5" above the box. Make a fist at your side, measure to the floor, subtract 2" for walking space and 2.5" for the handle height, that's how long your box will be. Two sides, a top and bottom, all made of a good grade of 1/2" plywood. The top leaves room for a slide-in-a-grove cover made of 1/8th inch plywood, the back side of the cover is painted flat black as a background to shoot paintings on. The depth of the box is 6". Inside this large outside box sits a 2" high, 1/4 inch plywood 5 sided article box without a top that sits on top of an 1/8 platform board which is sitting on top of the 1/8" plywood grid of 5 shelves and 10 standing supports making 66 spaces. 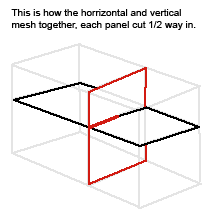 The grid has an open top, sides and bottom and just fits inside the outer box. 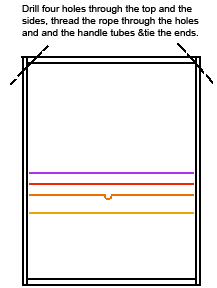 Each of the 11 horizontal and 6 vertical tube holding space measures 1.25x1.5 inside. Paint them before assembling it. Cut all the shelves or supports all at once with an 1/8" blade set and mesh the horizontal and vertical together, you don't need glue. Set the platform and box on top. Next is the 1/8" plywood brush box with a canvas hinge on the lid. This box is for the brushes I prefer to use all the time. It is one inch high. Inside along the bottom is a 1/2 inch high set of sides to support another 5 sided box shelf for the smaller brushes. Both the bottom area and top shelf box have two long divisional spacer bars. The 1/4" back is glued, stainless steel stapled and screwed on. The front has two slide in 1/8 panels. 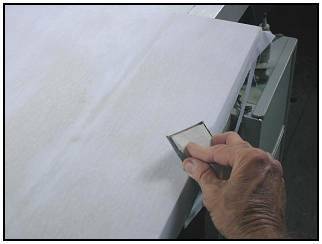 The bottom panel reaches to the top of the paints. The top cover panel has a lip covering the opening between the front cover panels, so rain doesn't get in when it's closed. The big box has two vertical 1/8" blade cuts 1/4" in from the front for the panel covers to slide into. Don't paint the inside of the panel cuts or the section of the panel that will fit into the panel cuts. Wax them after the panel is painted. On top of the brush box are two flip-top lidded, canvas hinged, 1" high palette boxes also made of 1/8" plywood. I used yellow PVA wood glue dried on each side and a third wet coat to join them. Today I would probably use super glue. On the top of the lid I mounted thin plexie glass or better.. thin styrene. This is my wet palette on top. I start with jar white only on the wet palette. Pick up the color I want from in the palette box and carry it to the top. Don't forget an occasional spray inside to keep the paints moist for over a week of everyday painting. 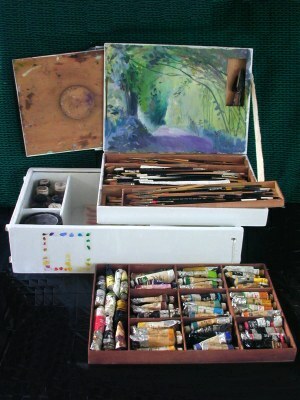 The brush box and a palette come out for every painting. 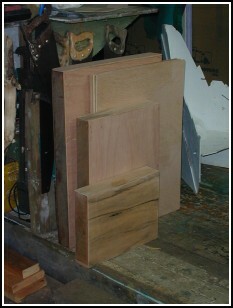 Next, filling the rest of the top area, are nine sized shelves from 1.25 to .50 inches high for speciality brushes. These shelves set on 1/4 inch runners attached to the inside of the big box. There is one side only on these shelves, in the front so brushes can't fall out. There is also a 2" shoulder strap from an old seat belt that's just long enough so while it's on my shoulder my forearm fits under the handle so I get support in two places. I carry 60 colors all the time, for the normal palette setup colors click here. The tubes with the painted color tops are in a special logical order. All oppositions match the color wheel so it's easy placing them back. After a while it's like using a color typewriter. 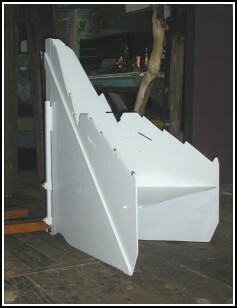 Here is a manufactured panel I like by Art Boards, 800-546-7985. As the support, Patric Mackin of Brooklyn, N.Y. makes the panel I would buy if I didn't make my own. He uses a Ph neutral glue, a fine weave Portrait Grade canvas, on a high grade 1/2 in. birch plywood panel. I recommend it. 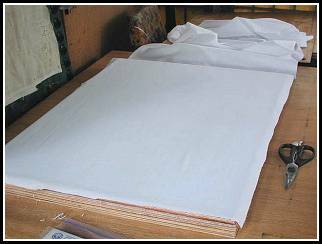 You can order by the square foot too instead of having to purchase larger sheets and cutting it yourself!